Mobile Hotel Web vs. Native Apps…Why not both? It’s no secret – we love our phones, and we spend a lot of time on them. According to Flurry, one of the leaders in mobile analytics, we spend around 2hrs and 42 minutes on our phones every day. The mobile industry is a booming one, and we owe it to tech companies and developers creating personalized content for an optimal mobile experience via the mobile web or native apps. 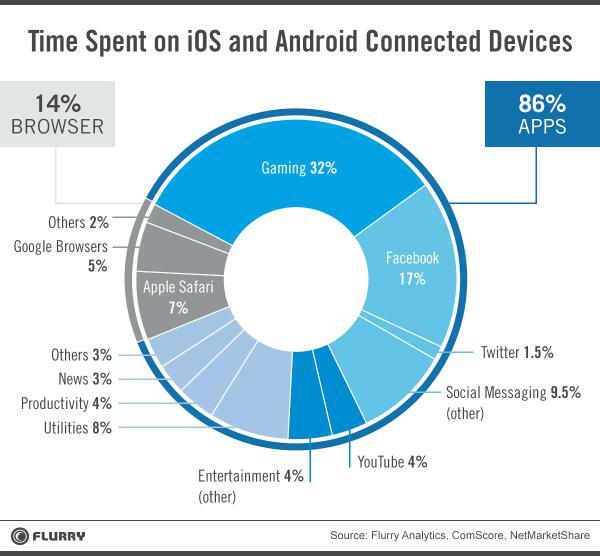 Most of our time is spent on apps, as they command 86% of the average US mobile consumer’s usage. Native apps live on a user’s handheld device, and are reached through icons that are on a home screen. Apps need to be installed via an app store such as the Apple App Store, or Google Play. Although apps are developed specifically for each OS, the end result is one that can incorporate and use all the tools from a mobile device, like its camera, contact list, or GPS. Apps do not require an Internet connection to operate, and they also support gestures, and notifications. Most importantly, apps are faster than the mobile web. All of these benefits allow for a very personalized user experience, and thus, apps have become extremely popular. Time spent on the mobile web has declined, and averaged only 14% of the US mobile consumer’s time. If the numbers so strongly suggest apps are the better choice, why has the “mobile web vs. native app” become such a red-hot debate? The debate is happening because using the mobile web has its benefits too, and the data does not show that some “in-app” time is really being spent on the mobile web. Many apps have built in browser capabilities, and most users follow web links, while technically still staying within the app. Additionally, once games and all the social media messaging apps are eliminated, the equation shifts to 35% of time spent in browser and 65% in apps. The mobile web is accessible from most, if not all mobile phones, and therefore it’s easy to reach a very wide audience quickly. The mobile web does not require any app approvals, nor does it have hardware or memory requirements. With all of the different ways we use our mobile devices for storing and categorizing what is important to us, being able to access information and not have to sacrifice space in our phone to do it is important. There is room for a third option – the hybrid. Could hybrids be the answer to the debate revolving around native apps and the mobile web? The evolving mobile industry seems to point towards yes. Native apps have added browser capabilities, and smart web designers are making the mobile web more “app-like”. There is room to argue that the best user experience may be achieved via a hybrid of the two worlds, and certain companies like Flipboard have become wildly successful by doing exactly that. Each business has a unique mobile audience with their own expectations; however, the continued blurring of the line between native apps and the mobile web seem to suggest that their customers want both. By Ronnie Coleman, Sales Executive at StayNTouch.